Another diversion from latch hooking is "Touch Tapestry" which bears some similarity to rug-punching techniques. 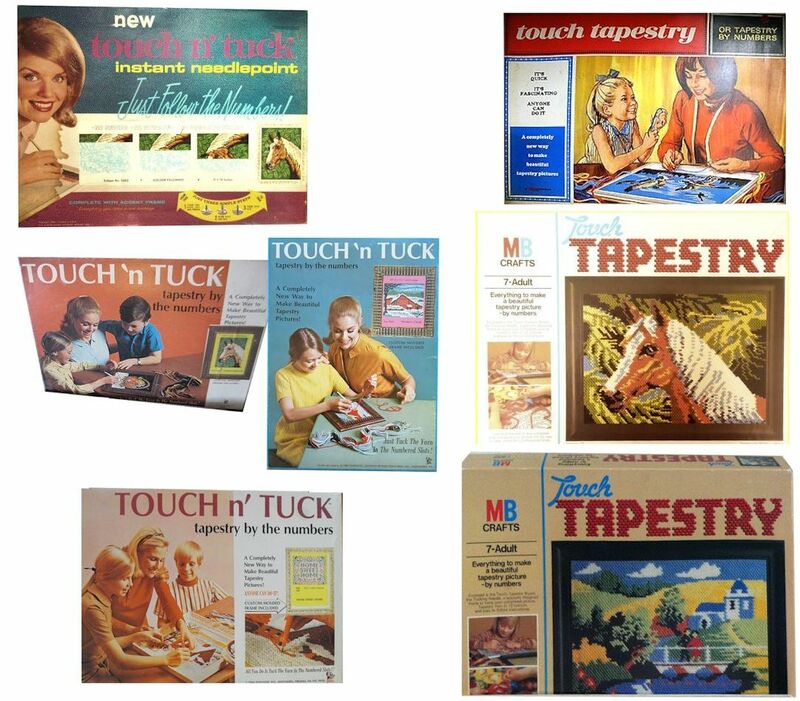 “Touch Tapestry” (known in the USA as “Touch ‘n Tuck”) was a method of making tapestry pictures by numbers and without any stitching. 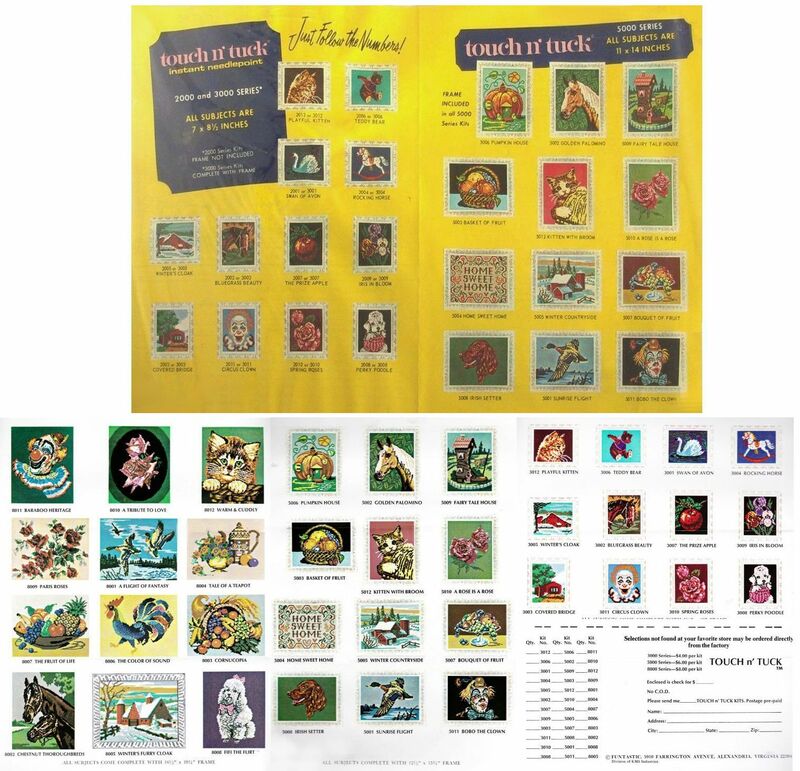 These were sold between 1968 and into the 1970s. At this period of time, “painting by numbers” was a popular pursuit, so why not tapestry by numbers as well? 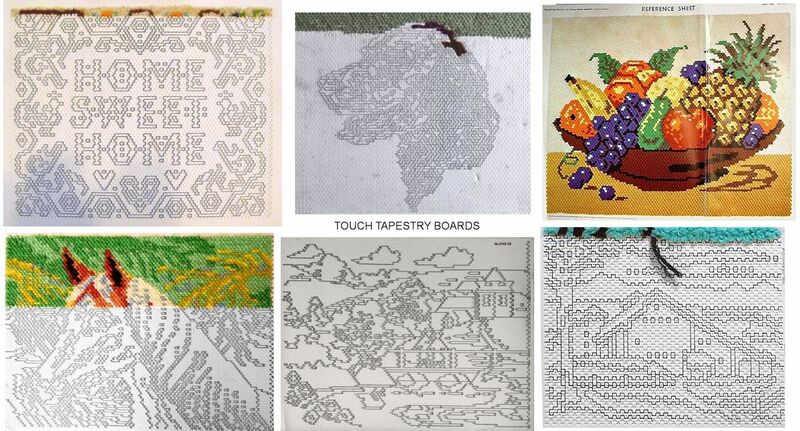 I received a Touch Tapestry Kit from my paternal grandmother around 1975. At the time I was hooked on Penelope Junior Tapestry Kits, but I was less impressed by Touch Tapestry. For one thing, I tended to press the tucking tool too hard into the board and break the slots, which meant the wool was not held in place. Also, I liked the feel of wool being stitched through the holes of conventional tapestry canvas. Early Touch Tapestry kits were sold under the Tri-ang name, but later ones (such as my kit which, incidentally, depicted an Alsatian dog’s head) had the MB Crafts logo on them. Tri-ang was the trademark of William, Walter and Arthur Edwin Lines (Lines Bros Ltd); three Lines make a triangle, hence Tri-ang. At its peak, Lines Bros Ltd, was claimed to be the largest toy maker in the world making a huge variety of toys. MB Crafts was a division of the Milton Bradley Company, an American board game company. The kits cost under 40 shillings/£2, which works out around £25 in 2016. I’m not sure when they changed from Tri-ang to MB Crafts. The Patent No was 3240176-A “Method For Making Simulated Needlepoint Embroidery” filed on July 3rd, 1963 by John R. Morrison of Brooklyn, New York, and published March 15th, 1966. It was a new method of making needlework items that readily lent itself to commercial manufacture and distribution in the form of kits. The novel components were the perforated board and the punch tool. The yarn was “held in association with the ornamented surface by an effective sharing or pinching action resulting from the special nature of the surface itself and of the method and means by which the yarn is applied. The resultant articles are nonetheless difficult to distinguish from conventionally produced tapestries and embroideries, and the invention thus makes it possible for relatively unskilled persons rapidly and inexpensively, and pleasurably, to produce simulated needlepoint embroideries.” The base was described as a top layer of an elastic material such as paper, defining a pierceable surface, pre-perforated and marked with the design. The under-layer was a thicker cellular material which is relatively stiff and rigid, yet yieldable and readily penetrable, such as expanded polystyrene exhibits. 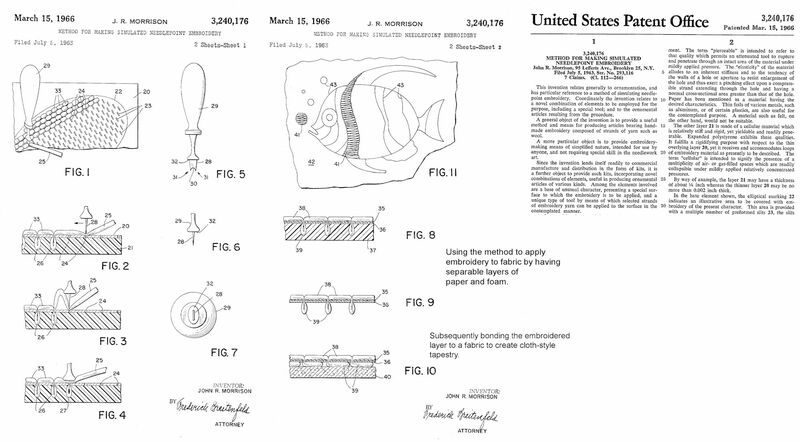 The patent cited others that related to tufted products and was in turn referenced by later patents relating to making tufted products bonded to a backing surface. 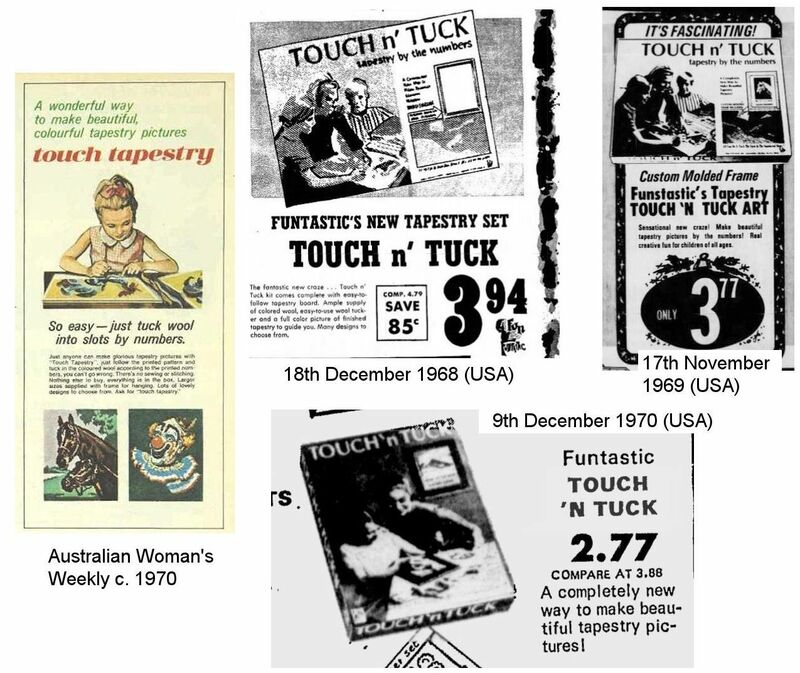 Advertisements of "Touch 'n Tuck" referred to it as "instant needlepoint" and the sensation of two continents. While I knew this as a child's craft, in the USA there were classier oval-framed Wedgewood-style patterns available. It also appeared on little girls' wish lists for birthdays and Christmas. “Exciting” was not the word I’d use, but it certainly was absorbing. The “soft, richly coloured wools” were, if memory serves, synthetic in the mid 1970s. 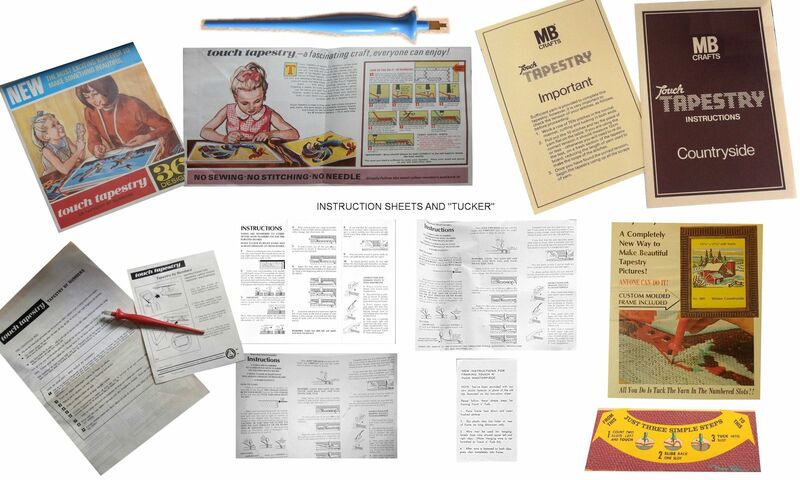 In the USA, these were sold as “Touch ‘n Tuck” kits. 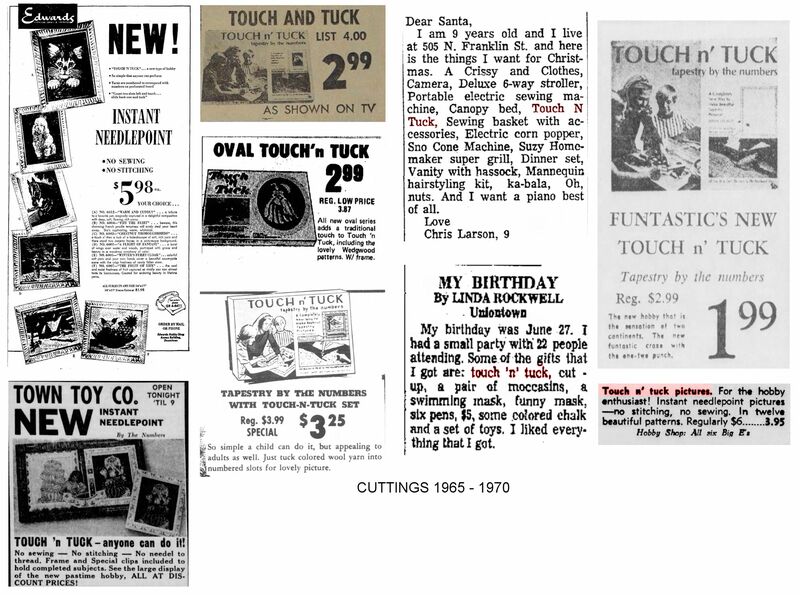 The Touch ’n Tuck trademark was owned by Max Klein Inc of Ferndale (a plastics company), filed in 1964, registered in 1966 and expired in 1986. They were sold under the Funtastic brand.